Black and brown women, all over Europe are being publically and routinely dragged, denigrated, demonised and attacked. From Brixton to Barcelona those in public life, have had to endure the poisonous and wretched rhetoric of everyday racism to outright fascism. Racist propaganda from irresponsible politicians and a very right-wing media, literally results in lethal violence on our streets. In the UK, we are well acquainted with the tragic effects of such poisonous rhetoric in the political assassination of MP Joe Cox by a avowed right-wing white supremacist. All across Europe racism and fascism are on the rise. 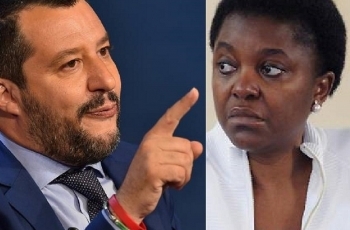 In Italy, the birth place of Mussolini and the ideological homeland of modern day fascism, Italy’s first black Minister and now a EU MEP, 54 year old Congolese woman, Cécile Kashetu Kyenge, is enduring the kind of racism most thought long extinguished in modern day Europe. It appears that the spirit of the fascist Italian Mussolini is alive and well and represented today in the form of the extreme right win, political party, the Northern League now known simply as Lega. Cecile is now faced with being sued for Libel for calling the Lega one of Italy’s most racist and pro fascist parties a ‘racist party”. The Lega, Deputy Prime Minister Mr Salvini has issued a legal writ suing Cécile for defamation of his party. This cannot be allowed to stand and an on line petition has been launched to persuade Italian courts to have this legal action thrown out. This is important and we need your support. The consequences of this case going ahead will be to criminalise any criticism of Lega’s racism and normalise racism in Italy in general. We need your full an active support for Black woman in public life, who right across Europe from Italy to London, see woman like Diane Abbott MP and Cecile dragged and denigrated, hung out top dry by right wing fascists and a supine right wing media. Cecile’s story should be a shining example of successful African migration to Italy. After arriving in Italy in 2002 she founded the Association for Intercultural DAWA ("Dawa" is a Kiswahili word meaning "medicine"), with the aim of promoting mutual understanding of different cultures and develop processes of cultural awareness, social integration and mutually beneficent cooperation between Italy and Africa. Not according to the fascist Lega however. This collection of white male, stale Italian neo Nazi’s, have sought to denigrate and undermine Cecile’s political career from the get go. Italy’s first black minister has been a target of racist slurs since her appointment and at her very first speaking engagement was faced with being bombarded with bananas, thrown towards her while she was making a speech at a party rally. In 2013 Roberto Calderoli, a former minister under Silvio Berlusconi and senate vice-president of the Northern League, revelled in the controversy that ensued after he stated that the country's first black government minister had "the features of an orangutan". Such white supremacist language, reflecting the traditional pseudoscientific hierarchy and racist propaganda of 20th-century white supremacy has always sought to suggest, that white people are descended from God and that black people are descended from apes. It's a consistent and regular racist trope that should be a historical relic, along with those who retain such disgusting beliefs. Mario Borghezio, a member of the European Parliament for the League, said that Kyenge wanted to "impose her tribal traditions from the Congo" and branded Letta's coalition a "bongo bongo" government. "She seems like a great housekeeper but not a government minister." In 2002, the European Commission against Racism and Intolerance (ECRI) condemned the party, saying "members of Lega Nord (as it was then known), made a particularly intense use of racist and xenophobic propaganda, although it should be noted that even members of other parties used a xenophobic or otherwise intolerant political talk". Again in 2006 the ECRI noticed "some members of Lega Nord have intensified the use of racist and xenophobic political talk". While noting that many offenders were local councillors it also noted significantly although most "were mostly local representatives… some important political leaders of the party at the national level issued racist and xenophobic statements. The ECRI also records that "in December 2004, the court of first instance of Verona found six local representatives of Lega guilty of incitement to racial hatred, in connection with a campaign aimed at ousting a group of Sinti from a temporary camp in the local territory". She went on to say “I’m a symbol in Italy,” she said. “I’m a symbol for migration, for diversity.” In addition, she is also a symbol of antiracist resistance and the political agency of black people in Europe. Please support Cecile and help build a wall around the reality of a resurgent Italian fascism. There can be no place for fascism in Europe.